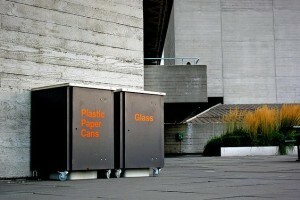 London is behind many other UK cities when it comes to recycling. Figures from London Councils show that we recycle 30% of our waste, behind Bristol (43%), Manchester (42%), Liverpool (39%), Leeds (36%) and Nottingham (32%). That figure hides a wide disparity between boroughs. Green Assembly Member Jenny Jones says that while Bexley recycles 54% of its waste (take a bow, Bexley), Hammersmith and Fulham, Kensington and Chelsea, Lambeth and Wandsworth have actually slipped back in the amount they recycle — between 5-7% since 2008. We've also started incinerating more, from 20% in 2009-10 to 36% in 2011-12 (latest figures). It's not all waste going literally up in smoke: there are four Energy from Waste facilities around London, with another approved for Sutton. One of the reasons for London's low household recycling rate (34% as opposed to the national average 43%) is that many of us live in flats and it is, frankly, a pain in the arse to have a load of different boxes in your kitchen and then lug them all down to the various bins. We also have fewer gardens so we don't get to boost our recycling rates with composting. But if you've ever spent time somewhere like Germany, you'll know they've pretty much cracked the recycling culture and it's just second nature. London Councils suggests we could be more incentivised if we all recognised that our local councils can make money out of recycling and also if there was more uniformity across different boroughs. We move around more; what you might be able to recycle in your old home may be completely different in your new place and can lead to frustration and disillusionment. Photo by only lines from the Londonist Flickr pool.